A European bison roams free in the Poiana Ruscă Mountains for the first time in two centuries..
Rewilding Europe and WWF Romania are delighted to announce that a group of 14 European bison are now wandering free in the Poiana Ruscă Mountains of southwest Romania for the first time in two centuries. The group were translocated to the rewilding area in May 2018 from various nature reserves in Germany and a reserve in Romania, and had previously been held in a pre-release acclimatisation enclosure. 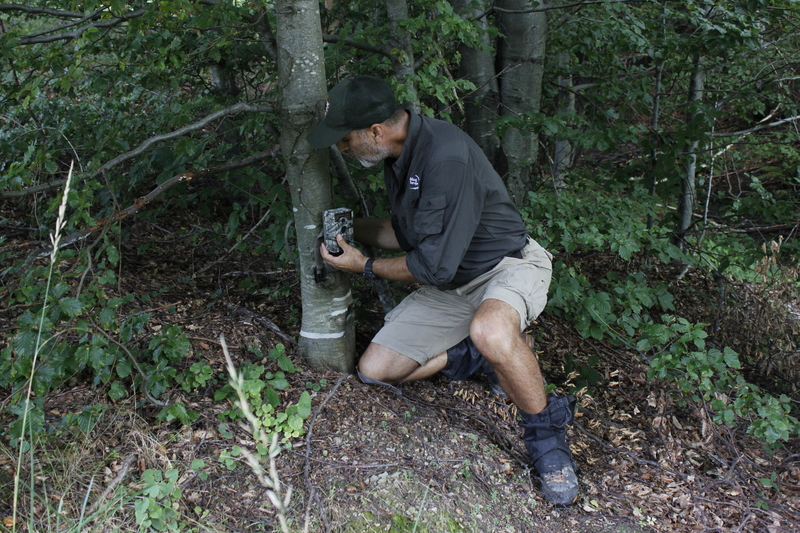 A bison ranger installs a camera trap prior to the bison release in Poiana Ruscă. With wild bison hunted to extinction in Romania around 200 years ago, Rewilding Europe and WWF Romania began reintroducing bison into the country’s Southern Carpathian mountains in 2014. This became a European Union-supported LIFE Bison project in 2016. The overally objective of the project, whch runs until 2021, is to establish a wild bison population that is demographically and genetically viable by reintroducing a total of 100 individuals at the Poiana Ruscă and Țarcu Mountains Natura 2000 sites. These animals are being sourced from zoos, breeding centres and nature reserves across Europe, and also from Romanian reserves such as Vama Buzăului. In addition to the Poiana Ruscă release, a further nine European bison were released into the wild in the Țarcu Mountains, at the second rewilding area in the Southern Carpathians, on August 30. These animals join a wild herd which has been steadily increasing in size here since 2014 as a result of annual translocations. Last year three bison calves were born into this herd, while this summer an additional three calves were added. This means there are now a total of 53 bison roaming free in both rewilding areas. 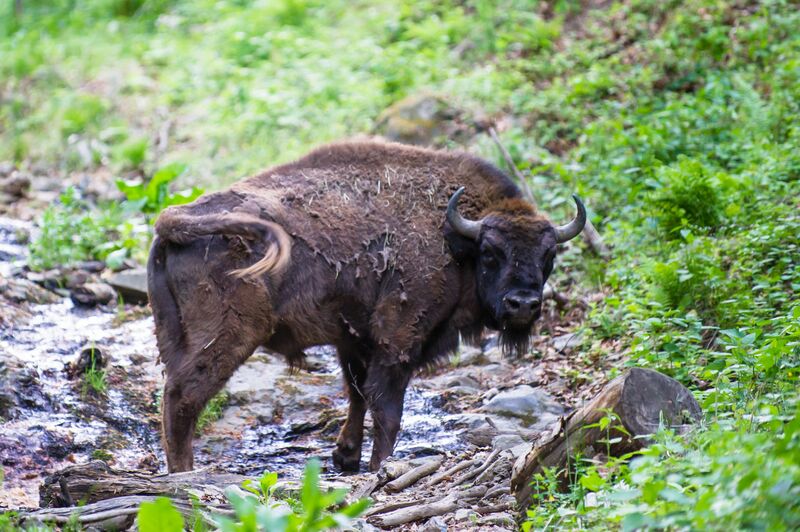 The recent Poiana Ruscă and Țarcu releases represent another milestone in the comeback of the European bison, which was once in danger of disappearing forever. In 1925 the last wild European bison was poached in the Caucasus, leaving less than 60 animals alive in zoos and private parks. Thanks to breeding and reintroduction programmes the current population of wild and captive European bison stands at around 7000 individuals. By reintroducing bison in some of its operational areas, and facilitating the animal’s return at other rewilding sites (through the European Wildlife Bank), Rewilding Europe is playing a major role in this wildlife success story. In late August nine European bison were released into the wild in the Țarcu Mountains, at the second of the Southern Carpathian rewilding areas. In 2017 and 2018 bison calves were born into herds reintroduced in both the Southern Carpathians and Rhodope Mountains (Bulgaria) rewilding areas. In the Carpathians, our flagship bison reintroduction area, this proves that ongoing efforts to restore a viable free-roaming bison population have a real chance of success. In a rewilding context, the benefits of bison reintroduction go way beyond the simple survival of a species. The grazing of these huge herbivores opens up landscapes and creates new habitats for other fauna such as insects and birds, while their integration into dynamic food chains is helping to strengthen the Circle of Life and boost the comeback of predators such as wolves and bears, and scavengers such as vultures. In the Southern Carpathians the high-profile status of the European bison is also breathing new life into a depressed local economy. Young people have been employed as bison guides and rangers, while the rewilding area is becoming increasingly well known as a wildlife tourism destination, with bison watching and tracking experiences offered through the European Safari Company. Read more about the LIFE Bison project here. Learn more about the Southern Carpathians rewilding area here. Visit the Rewilding Southern Carpathians Facebook page here. Those interested in seeing reintroduced bison in the Southern Carpathians up close should visit the European Safari Company website here.